Joe is an TLC Endurance athlete attending university in Leuven, Belgium. Originally from the Chicago area, Joe is testing his mettle in the European racing circuit – in both road (riding his Specialized Roubaix) and cyclocross (on his Specialized Crux) – as well as enjoying the famed cobbled streets that make European cycling so challenging. Every day on the bike is an absolute joy. Always smooth and comfy over various pavé but responsive when I get out of the saddle. The Specialized Roubaix has become my favorite day-to-day bike. I grab it even for easy rides along the local paths and for challenging interval workouts. However, even though Belgian cobbles are quite a challenge, I had to take it for the real test: Paris Roubaix. Most pro races have cyclo-sportives the day before, like the Omloop Het Nieuwsblad I participated in earlier this year. The big classics, such as Paris-Roubaix, Ronde Van Vlaanderen, and others, are no different. So I registered for the Hell of the North. 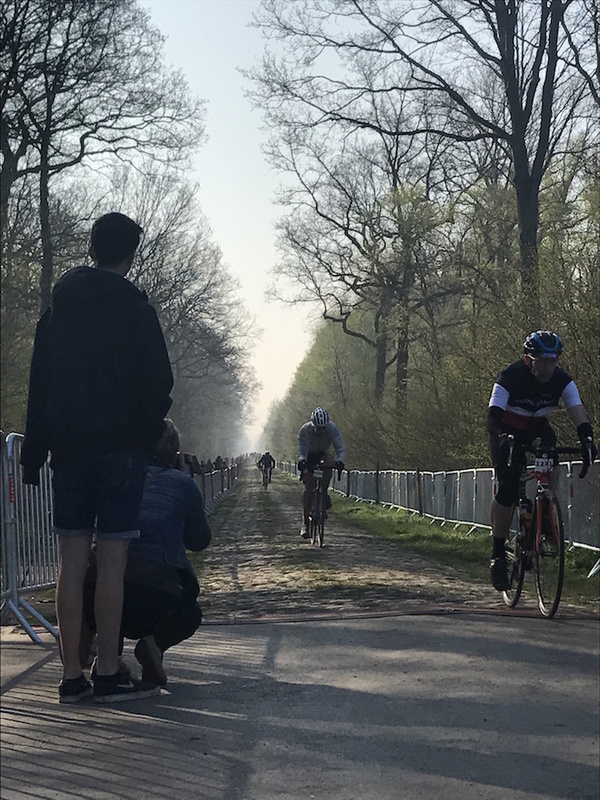 The route options included a 75km loop from Roubaix, a 145km loop from Roubaix, or a 175km point-to-point ride starting at the first cobble sector and following the pro route the whole way back. I opted for a 145km day, so I could spend time taking pictures, eating rest-stop snacks, and savoring the cobbles without having to worry about hitting a time limit. The route would start in Roubaix and head south to Sector 19: Trouée d’Arenberg, a five star sector. We would then follow the pro route all the way back into Roubaix, covering a grueling 32.7km of cobbles on the 90km journey home. The day before, I rode to packet pickup, and, just for fun, rode over one cobble sector near the velodrome. It was made very clear to me: “Hell of the North” is an understatement. There is a reason for Roubaix to be named Hell. The next day, it started off seeming to be a miserable day. It was about 4ºC, foggy, a bit of a breeze, and on-off mist. I got super chilly on my ride over to the velodrome for the start, continuing to second-guess myself on clothing choices, etc. Just before taking off, I slammed a few hot cups of coffee and ate a few bananas, and began the charge toward the Forest of Arenberg. The fog began to burn off, and the sun began to peek through the clouds. The temperature began to rise and it was comfortable and I was warmed up perfectly a few km from the Trouée d’Arenberg. On cue, a peloton of nearly thirty riders pulled up alongside me, and I hopped in. Just like in the pro race, the pace was high with a few hundred meters until the sector. And before anyone knew it, I was there. The goosebumps began immediately. It was just like I’ve watched year after year on television. Riders in front of me kept getting slowed by pictures or just the jarring of the cobbles. One by one, they peeled off to the side. I kept picking off riders. The bike was incredible. It allowed me to focus less on the cobbles, and more about pushing power. Needless to say, it hurt, a lot. These cobbles would still shake you in a 4×4 pickup. The sectors kept coming, each more jarring than the next. I found a companion in a rider from Colorado, Karl. He and I continued to push each other on the cobbles, and make good conversation light-pedaling between sectors. Over each sector, I became more and more fatigued. After some sections, gripping the bars too hard, my hands would feel glued to the tape, and I’d have to pry them off. I watched people around me, however, and felt myself being much better off. Only once did I nearly lose control, while trying to ride a gutter and hit a sideways cobble. The sun came out, and by the Carrefour l’Arbre, there wasn’t a cloud in the sky. I shed the leg warmers and leg warmers earlier, and got to work on the tan lines. It was becoming on of the most enjoyable rides in a while. The five hours flew by, and then the chills set in. We entered Roubaix, and came down the final parkway, the one I’ve watched on TV time and time again. We turned right through a gate, then another right hander under a big inflatable arch, and onto the infamous velodrome. Honestly, I cried a little. It was a magical moment, being on the same surface as many victors of one of the hardest races of all time. I laid in the grassy infield, ate a few cheeseburgers, a couple recovery lagers, and took a little nap. My bike, a week and a half later, is still covered in the “famous dirt.” On my shelf, I have two little cups, one full of small “cobbles” the other full of “roubaix dirt” I grabbed on course. I was sore for three days after the event. Not so much my legs, but I had shooting pains my arms, my neck, my back, and my fingers. However, never have I felt such an enjoyable pain. I was on a ride-high, and wanted to keep riding through the soreness. I can’t imagine trying to ride this on an average road bike, or even on one of the bikes that Eddy Merckx or Sean Kelly did it on years ago. I’ve experienced a piece of the Hell of the North. I can’t wait to get another under my belt next year.